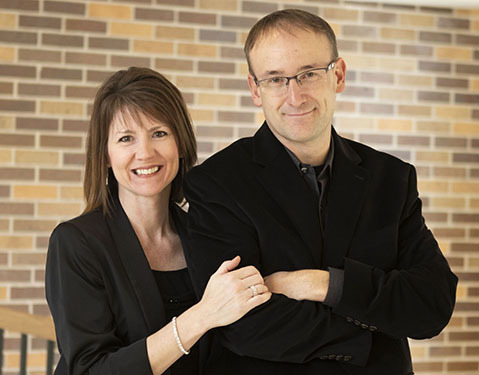 Shelly & Matthew Armstrong: Bio & Choral Music | Santa Barbara Music Publishing, Inc.
Shelly Marshall Armstrong (b.1977) is the full-time staff accompanist at Wayne State College in Nebraska. A native of Iowa, she earned a Bachelor of Music Education and Music Therapy degree from Wartburg College and received a Master of Music in Music Education degree from the University of Northern Iowa. Her professional work has included teaching K-12, accompanying K-12 and collegiate ensembles, and serving as a music therapist in the hospice setting. In collaboration with her husband, Matthew, concert and jazz choirs under their direction have been selected to perform at regional and national ACDA conventions, including the vocal jazz night at the 2011 ACDA National Convention in Chicago. Matthew A. Armstrong (b. 1974) is Director of Choral Activities at Wayne State College in northeast Nebraska. A native of Iowa, he received a Bachelor of Music Education from Wartburg College and a Master in Music Education from VanderCook College of Music in Chicago. He is in candidacy for a Doctor of Musical Arts in choral conducting at the University of Nebraska-Lincoln. Prior to his studies at Nebraska, he spent 16 years teaching music at all age levels from K-12 and collegiate in the state of Iowa. Armstrong’s concert and jazz choirs have been selected to perform at regional and national conferences of the American Choral Directors Association, including the vocal jazz night at the 2011 ACDA National Convention in Chicago. Shelly & Matthew Armstrong has 2 titles published with Santa Barbara.